Amelia Zemlock’s face is one you may recognize. Not only is her smile contagious and hard to forget, Amelia was featured as the 2015 LPF Calendar cover! 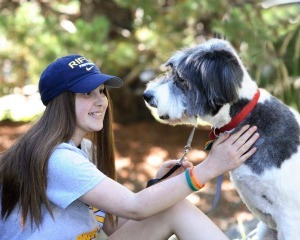 Amelia has come a long way since that photo shoot in July of 2014, which occurred just two months after she was diagnosed with osteosarcoma, bone cancer, at the age of 17. Exhaustion from weeks of chemotherapy, coupled with her recent limb-salvage procedure to remove her cancerous tumor and save her leg, made it very difficult for Amelia to join us on that warm summer day for the shoot. However, what we learned that day, and would continue to learn over the course of Amelia’s treatment, is that her strength and determination can carry her through nearly anything. 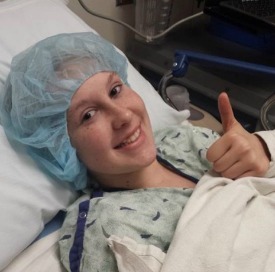 Amelia was diagnosed with osteosarcoma shortly after wrapping up her junior year of high school in Rifle, Colorado. An avid volleyball player, Amelia was understandably shocked and devastated by this difficult diagnosis. With the support of her parents, her two brothers and the whole town of Rifle, Amelia began treatment in Denver at Presbyterian/St. Luke’s Medical Center. Under the interdisciplinary team of Drs. James Ball, Cynthia Kelly and William Brown of the Denver Clinic, Amelia immediately began chemotherapy to shrink her tumor, and later, a tibia replacement to remove the cancerous tumor and replace her bone with an internal prosthesis. Once she had recovered from her surgery, Amelia began post-operative chemotherapy. For another three months she traveled between Rifle and Denver to seek treatment, accompanied by her mother Debbie. 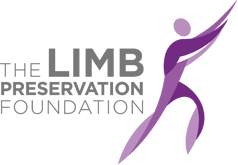 The Limb Preservation Foundation is proud to have been beside Amelia and her family during this experience, providing support with travel and lodging expenses in order to ease the financial burden for the Zemlock’s. Such extensive travel was very difficult for Amelia, who was often very ill from the side effects from chemotherapy. On a handful of occasions, Amelia had to be airlifted to her medical team at P/SL because she was simply too sick to travel by car. During these very scary experiences, Amelia continued to exude hope and strength, motivated to beat her disease, recover from treatment, and return to Rifle to finish her senior year of high school. And that is exactly what Amelia did! 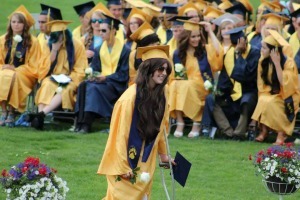 On May 31st, Amelia walked across the stage at Rifle High School with the graduating class of 2015, on her own two legs. To quote Amelia’s mother, Debbie, “It wasn’t always easy, it sure wasn’t ideal and nowhere near the senior year she had always envisioned, but it happened!” Not only did Amelia accomplish the incredible accomplishment of graduating on time, she is currently enrolled to attend Colorado Mesa University in Grand Junction, Colorado this fall. Because of her academic accomplishments and strong grades, Amelia was selected by The Limb Preservation Foundation to receive the Extremity Scholarship Award to aid in her studies at Mesa. Though osteosarcoma challenged Amelia’s life in countless ways, it clearly proved to be no match for this extraordinary young woman. What cancer could have destroyed, it only made stronger. We hope Amelia’s story reminds you, as she reminds us, that with enough determination and optimism, we can not only overcome great challenges, but thrive.